Preheat the oven to 350 degrees Fahrenheit. Lightly butter six, 8 oz baking ramekins then coat with sugar, tapping out the excess. Set the ramekins aside on a large baking sheet. In a large heatproof bowl, placed over a pot of simmering water, combine chocolate, vanilla, cinnamon, cayenne, and 1/4 cup water. Stir until the chocolate is melted and mixture is smooth, about 10 minutes. Remove from the heat and let cool to room temperature, about 20 minutes. Once cooled, stir egg yolks and matzo meal into cooled chocolate mixture until well combined. Set souffle base aside. In a large bowl or stand mixer, beat the egg whites and potato starch on until soft peaks form, about 2 minutes. Gradually add sugar and beat until stiff peaks form, about 5 minutes. In batches, add the egg-white mixture into the souffle base and fold it in gently, with a spatula, until combined. Divide the mixture to the ramekins and smooth the top. 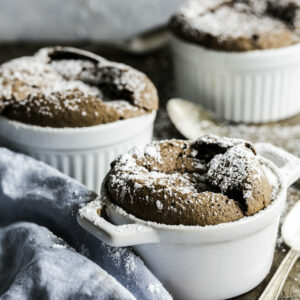 Bake the souffles until puffed and set, 30 to 35 minutes. Serve immediately, topped with powdered sugar.